After two professional seasons, Zach Ertz is blossoming into one of the NFL’s top all-purpose tight ends, but that process began long before he was drafted by the Philadelphia Eagles. For the Bay Area product, four years at his dream school, Stanford University, proved to be invaluable to his development both on and off the field. Out of Monte Vista High School in Danville, Calif., Zach’s recruitment process began much like many elite prospects: with a breakout junior season. In perhaps the most crucial season for Division I hopefuls, he was off to an excellent start. Through just seven games, he pulled in 38 receptions for 382 yards and six touchdowns before he was set back by a broken wrist. A few scholarship offers had come his way, but that injury raised some concerns for the young star—but fortunately, the offers kept coming. One of the schools that kept faith in the budding tight end was just an hour away, across the bay in Palo Alto. Stanford was Zach’s first offer, and it didn’t take him long to become one of the building blocks of the Cardinal’s 2009 recruiting class. 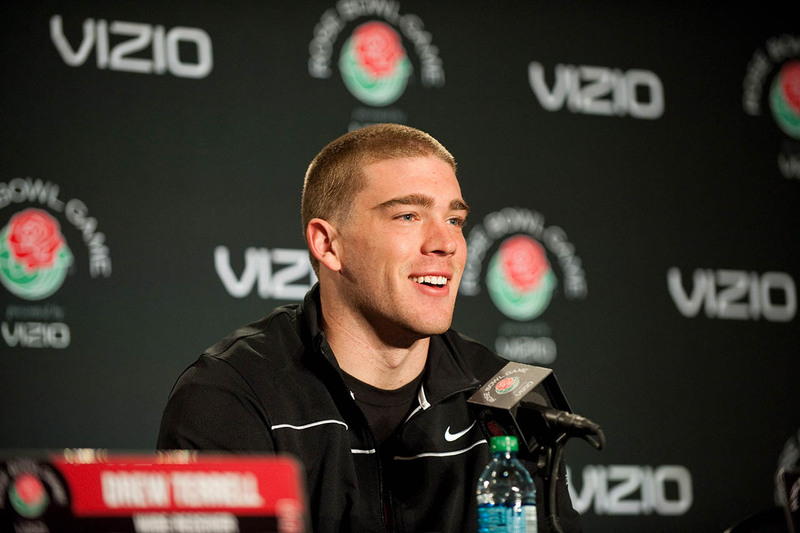 On Feb. 21, 2008—just days after the team’s 2008 class was cemented on Signing Day—Zach Ertz committed to Stanford. But when he pledged to Stanford, he knew that his spot on in the football program would be contingent on his academic standing—and being accepted into one of the top universities on the planet is nothing to take for granted, even for a coveted student-athlete. Zach loved the coaching staff at Stanford. Head coach Jim Harbaugh had the program on the rise, and David Shaw, who soon took over for Harbaugh at the helm of the program, was Zach’s lead recruiter. But despite everything drawing him to Palo Alto, he still had to cover that academic hurdle. Other schools up and down the West Coast knew this as well. The entire Pac-10 Conference came calling for the 4-star rated recruit, who was regarded as one of the top five tight ends in the nation. All of Stanford’s competitors courted Zach, hoping that he would decommit from the Cardinal—but he wouldn’t. Instead, he went to work both on and off the field. While grinding to keep his GPA high and studying to earn the best test scores possible, he also made his wrist injury an afterthought. He hauled in 56 passes for 756 yards and 14 scores, earning him All-State honors. Finally the hard work paid off. The acceptance letter came, and on Feb. 9, 2009, just less than one year after he verbally committed, Zach signed his Letter of Intent to Stanford University. When Zach committed to the Cardinal, Stanford wasn’t the powerhouse program it is today. The Cardinal hadn’t been to a bowl game since 2001 and hadn’t been to a BCS bowl since 1999. While some questioned why Zach, a recruit who could essentially write his own ticket, chose a program that had just wrapped up its seventh consecutive losing season, he was all in. In his first year on campus, Harbaugh’s group took the first visible step toward changing the program: The Cardinal went 8-5 and broke their seven-year postseason drought, earing a trip to the Sun Bowl. But individually, that first year was undoubtedly the toughest for Zach, who didn’t see any action on the field while taking a redshirt, preserving a year of his eligibility. However, just as he did when he committed, he kept faith in his coaches, the program and the process. So Zach spent that first year on campus adjusting to the challenges that come with being a student-athlete at one of the most rigorous academic schools in the country. And in the meantime, the strength program at Stanford was carving him into a Division I caliber tight end—and the progress he made in the weight room and on the practice field paid almost immediate dividends. After shedding the redshirt, it took no time at all for Zach to make noise at the collegiate level. In Stanford’s season opener against Sacramento State, he caught his first pass off the hand of Andrew Luck for a three-yard gain late in the first quarter. Then after a Sacramento State fumble in the second, Luck looked to Ertz again—and the freshman hauled in a five-yard reception in the end zone for his first career score. But on a team stacked with talent at receiver and tight end, and with plenty of size in short-yardage running situations, receptions were hard to come by for a freshman tight end. As the Cardinal dipped into conference play, Zach tallied just two receptions over the next six games—until an Oct. 30 trip to Seattle. The Cardinal were clicking against the Washington Huskies, as they cruised on both sides of the ball in a 41-0 rout. And late in the third quarter, Zach caught a three-yard score from Luck for his team’s final TD of the night. He finished the game with three receptions for 20 yards and that score, another coming-of-age moment for the young tight end. The process of growing up at the collegiate level is always tough, but playing alongside a Heisman Trophy candidate at quarterback in Luck made it much easier. Before the end of the regular season, Luck found Zach twice more for scoring receptions. 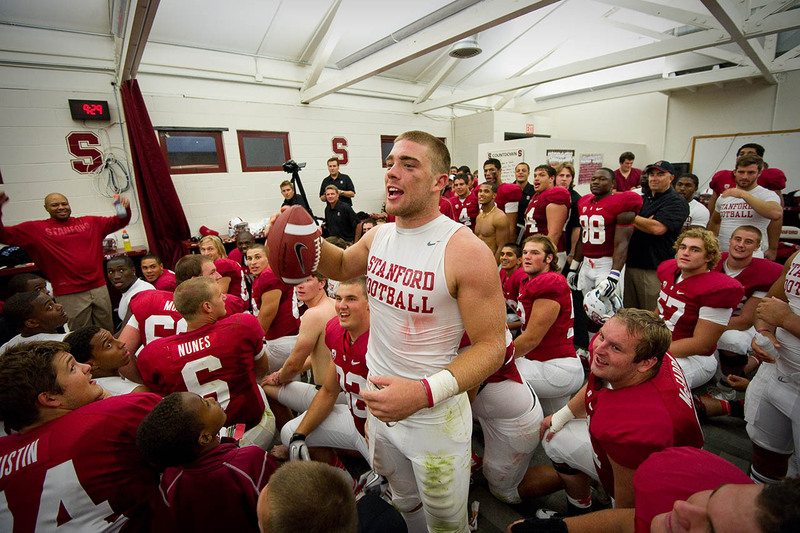 The next came in a 48-14 dismantling of Stanford’s rival, California. The next came the following week as the first score in a 38-0 rout of Oregon State, securing an 11-1 finish for the Cardinal. Zach and his teammates chanted “BCS! BCS! BCS!” in the locker room after the victory, and their hopes soon came true, as they earned a berth in the Orange Bowl against Virginia Tech: the school’s first trip to the BCS since 1999. In this game, Ertz pulled in another touchdown, this one more vital than any in his career. The Hokies had just taken a 9-7 lead in the second quarter, and Luck looked to Zach on the first play of the next drive for a 14-yard reception. The Cardinal kept marching downfield, until they faced a 3rd-and-8, where Luck looked right back to the freshman that was becoming one of his most trusted options—and Zach came through, taking a 25-yard reception for the go-ahead touchdown. Stanford never trailed after that and went on to blow the Hokies off the field in a 40-12 victory. Zach’s freshman year was a smashing success for the Stanford program, and while it set the Cardinal up to take more strides in the future, it also resulted in some big turnover. Jim Harbaugh, the head coach who recruited Zach to come to The Farm, received a call from the league, and answered it, becoming the head man for the NFL’s San Francisco 49ers. Fortunately, a familiar coach took his place: The offensive coordinator and Zach’s lead recruiter, David Shaw. Now under head coach Shaw, it didn’t take long for Zach to start blossoming. He caught touchdowns in each of the first three games of his sophomore campaign, and he averaged 44 receiving yards per game through the first seven games, and Stanford rolled to 7-0 with its average margin of victory at an astounding 36 points. However, in that eighth game of the year against USC, he suffered a knee injury, which left him out the remainder of the regular season. Stanford won that game over the Trojans, and the next one on the road against Oregon State, but it fell once again to Oregon before winning out in the regular season against Cal and Notre Dame. And once again, the Oregon loss was the one that kept the Cardinal out of the national title picture. However, the Cardinal still earned their way to a big bowl berth: A Fiesta Bowl date with the No. 3 Oklahoma State Cowboys. Like Stanford, OSU was hoping it would compete for a national title after a fantastic season, so both squads came out firing in the desert. The two offenses combined to amass more than 1,000 total yards, trading off touchdowns throughout the entire evening. After playing to a 21-21 tie at the half, Zach’s moment came. After a rare defensive stop, the Cardinal marched down the field, and on 3rd-and-6 from the 16, Luck dropped back and found Zach for a short reception. The Stanford tight end barreled his way toward the end zone, and he launched off his fully healed knee and over the goal line for the go-ahead score. Despite the loss, the season was a milestone campaign for Stanford, which went to back-to-back BCS-level bowls for the first time since it went to the Rose Bowl in the 1970 and 1971 seasons. As it turned out, the Cardinal ended up going to four consecutive BCS bowls, which had never before been done in the program. Zach played in three, and the legacy he and his teammates left on The Farm was extraordinary. While he and his teammates were lifting the program to new heights on the field, Zach was also taking care of business in the classroom. The redshirt year helped him to build momentum academically, and he was on pace to graduate on time at the end of his fourth academic year. With that in mind, Zach knew that his stars could align for an early exit to the NFL. If he worked hard, stayed health and performed like he could, he just might be able to head to the league after his redshirt junior campaign. With Luck gone, expectations were a little down on The Farm, but the Cardinal wasted little time showing that they were still ready to compete for the Pac-12 Conference championship. In their third game of the season, they played host to No. 2 USC, and they were locked in a tough battle. The defense did its job, holding Matt Barkley and Co. to just 280 yards. Then with the score tied at 14 early in the fourth quarter, No. 86 made the biggest play of the night. Luck’s replacement, Josh Nunes, found his big tight end up the seam on 2nd-and-10, and he hit him in stride. Zach hauled it in and lost two Trojan defenders with one juke, and he drug another would-be tackler into the end zone for what proved to be the game-winning score. The next game brought another big night for Zach, albeit in a defeat. He torched the Washington Huskies all night, hauling in six passes for 106 yards, but UW won out in the end on its home field. That was just one of a number of wild games on the year for the Cardinal. They went to overtime three times during Zach’s junior campaign, and played in 10 games decided by seven points or less. After the loss in Seattle, the Cardinal split a pair of OT contests: a Pac-12 win over Arizona, and a non-conference defeat against Notre Dame. After the loss to the Irish came another breakout game for No. 86. Against its neighboring rival Cal, Stanford leaned heavily on a Bay Area product in Zach. He caught six passes for a career-high 134 yards, and he hauled in a 20-yard score just before halftime of his team’s 21-3 win in Berkeley. Before Zach took the field for the Cardinal, the Golden Bears had won seven of the last eight meetings between the rivals. 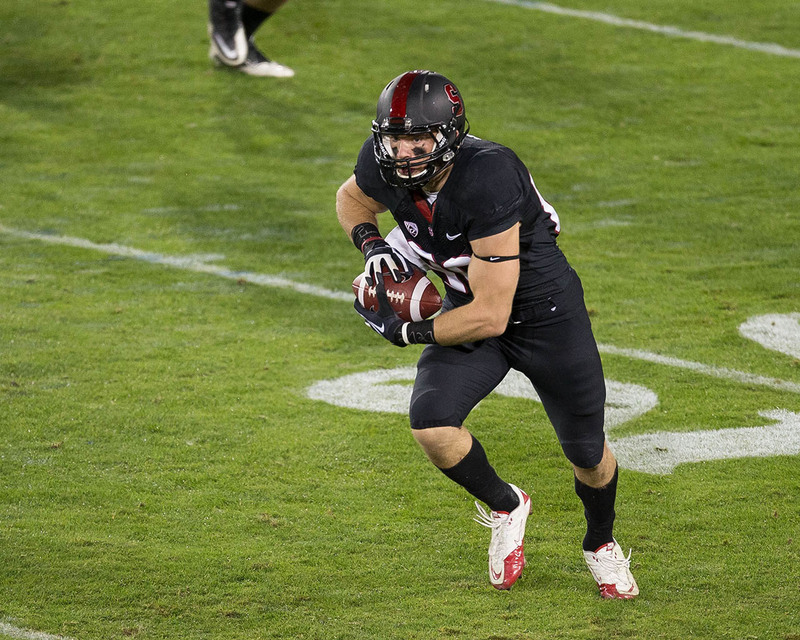 But excluding his redshirt season, Zach finished his career undefeated in The Big Game, tallying 179 receiving yards and two touchdowns in two games. In the three weeks following The Big Game, the Cardinal took care of business, beating Washington State, Colorado and Oregon State to set up an enormous rematch against the team that was a thorn in their side all of Zach’s career in Palo Alto: the No. 1 ranked Oregon Ducks. Zach and Co. traveled to the always-wild Autzen Stadium on Nov. 17, and the game of the year followed. The Ducks clung to a one-touchdown lead for most of the second half, and in one of their final chances late in the fourth quarter, the Cardinal looked to their go-to tight end. Kevin Hogan, making just his second start for Stanford, first found No. 86 on a 2nd-and-2 for a big first down that put the Cardinal across midfield. Two plays later, Hogan looked to Ertz again, and he grabbed another massive reception, and Zach threw a vicious stiff arm to his defender, making it a 22-yard gain down the right side with just over three minutes to go. While the drive was looking good, Stanford still needed points, trailing 14-7. After a first-down stop, Oregon nearly came up with a game-sealing play. Hogan looked left at Zach, and the ball instead found the hands of All-American corner Ifo Ekpre-Olomu. The only thing that prevented the pick-six was No. 86, who prevented the Duck corner from pulling in the interception. On 3rd-and-10, Hogan was nearly sacked, but he threaded the needle to his security blanket: No. 86. But the rushed throw left Zach one yard shy of the first down at Oregon’s 12-yard line. Fortunately, Stanford’s power game paid off on fourth down, and Zach’s close friend Ryan Hewitt dove over the pile a first down. Then on first and goal, there was no question whom Hogan was targeting. He looked left the whole way, and on a short drop, he fired a jump ball to his big tight end, and Zach won the jump ball over Ekpre-Olomu. However, initially, it was called incomplete. Blanketed by Oregon’s star corner, Zach was bobbling the ball on the way down, but after what felt like an hour-long review, the call was overturned. Zach gained possession while on top of Ekpre-Olomu, and his right shoulder hit the turf first—and a Jordan Williamson PAT tied the game at 14. The game then went to overtime, and Oregon kicker Alejandro Maldonado missed from 41 yards out. On its ensuing possession, the Cardinal succeeded where the Ducks couldn’t, and Williamson was good from 37 yards away, giving the Cardinal a 17-14 upset win, ending the top-ranked Ducks’ hopes at a national title. 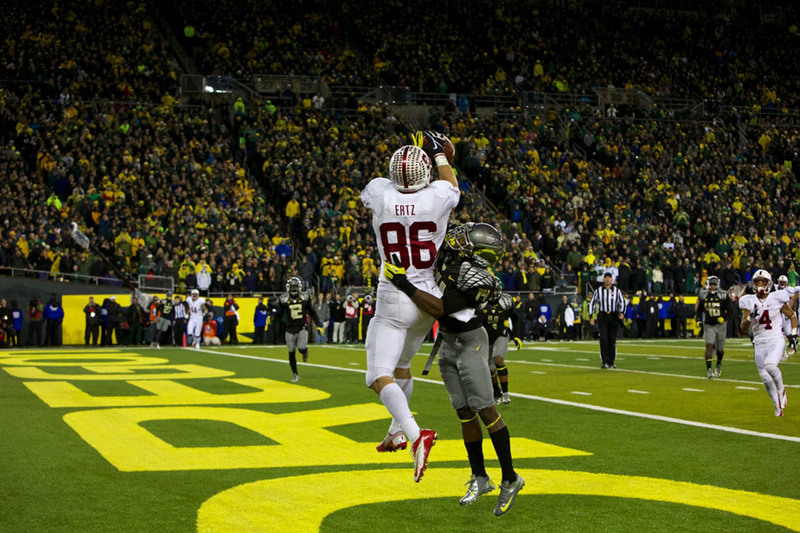 While that game killed Oregon’s national title dreams, it breathed life into Stanford’s hopes for a Pac-12 Championship. The Cardinal beat UCLA twice in the next two weeks: a 35-17 win in the regular season, and a 27-24 victory in the Pac-12 title game. 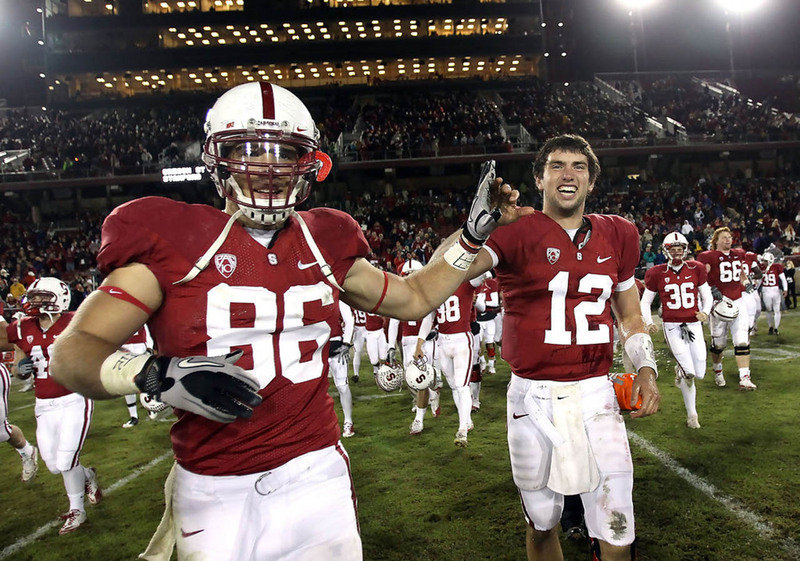 The win in the conference championship game also solidified Stanford’s third consecutive BCS berth. But this one was just a bit sweeter than the rest: The Cardinal were going back to the Rose Bowl for the first time since 1999. They were matched up with a similar, physical foe in the Big 10 champion Wisconsin Badgers, and Zach played a big role in setting up early scoring drives in Pasadena. He hauled in a nine-yard reception on the first drive, which ended in a 16-yard scoring run from Kelsey Young. On Stanford’s next drive, Hogan worked a play action on 1st-and-10 from around midfield, he was rocked as he released the football, but he found his go-to guy over the top. No. 86 has beaten the UW coverage and pulled down a 43-yard reception between two defenders. Stepfan Taylor punched in a three-yard score on the very next play, and Stanford was up 14-0. The Badgers were determined to prevent a rout, however. They tallied two touchdowns in the second quarter, with a Williamson field goal sandwiched in between to make it 17-14, Cardinal, at the break. Defense dominated the second half, but late in the fourth quarter, Ertz pulled in the final reception of his career: a nine-yard gain to help set up the final score of the contest: a 22-yard Williamson field goal that sealed Stanford’s 20-14 win. That final season, Stanford recorded its first Pac-12 championship since 1999, and its first Rose Bowl win since 1971. With those momentous achievements in hand, and a unanimous All-American distinction, Zach knew he had done all he could on the field at the collegiate level. His accomplishments off the field were paramount as well. He was on track to graduate at the end of the spring semester with a degree in management science and engineering.